Great for entertaining or relaxing in one of the world's top locations. 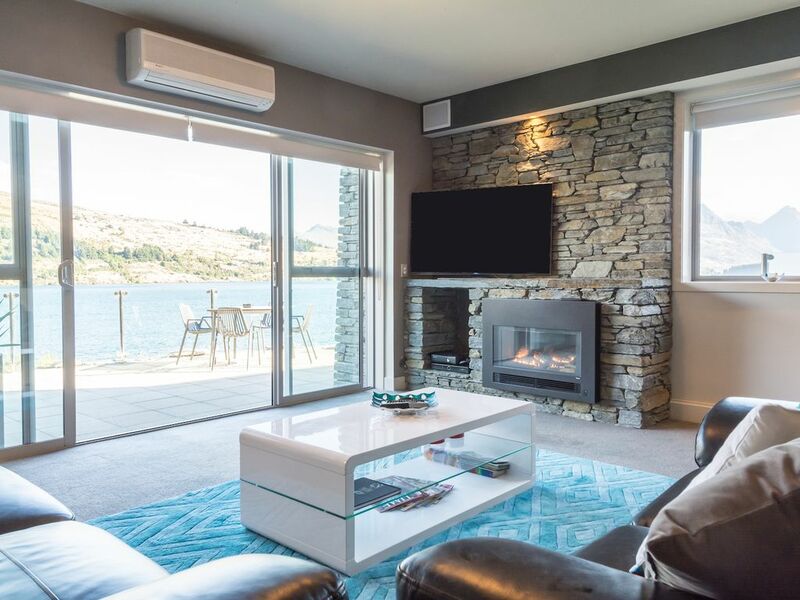 Boutique accommodation situated on the shore of lake Wakatipu, Shoreline Villa boasts uninterrupted views of surrounding mountains from the living area, lakeside terrace, and bedroom balconies. The boutique Shoreline Villa provides you with uninterrupted views of Lake Wakatipu and the surrounding mountains from your private lakefront terrace and living space. Our luxurious 3 bedroom villa with full kitchen and spacious lounge is ideal for larger families or groups. Spread over 3 levels, the Shoreline Villa has three king bedrooms, each with its own ensuite bathroom (one with spa bath). One of the bedrooms has its own kitchenette and living space, and can be closed off from the rest of the house if desired. At your request, all bedrooms can be configured with a mix of single or king beds to sleep up to 4 people per room. This gives you the flexibility to suit the specific needs of your group. Shoreline Villa sits lakeside in the Alpine Village Complex. It is a prime location for all that the area has to offer, being just a 5 minute drive from both the airport and from central Queenstown, and only a 30 minute drive to the popular Remarkables and Coronet Peak ski fields. There is also the option of a beautiful scenic walk to town via the lakeside track starting at your doorstep. Alternatively, there is a bus stop only 1 minute's walk away, with buses running into town every 10 minutes, and also to the airport and to nearby Arrowtown. At Shoreline Villa, you’ll be within a stone’s throw of all local attractions, yet ideally located to enjoy our idyllic waterfront setting. Central Queenstown is a bustling hive of bars, restaurants and shops, making it a vibrant town centre to entertain every visitor. Originally a mining town home to gold rushers, Queenstown has blossomed into the home of adventure sports and the ultimate base camp for visitors to our stunning, pristine natural playground. In town be sure to visit the waterfront, walk to the Queenstown Gardens, or enjoy a ride up Bob’s Peak on the gondola to ride the luge or simply have a coffee and enjoy the view. The studio room with balcony is available if you have booked for 6 or more people or paid a flat fee for the whole house; otherwise this will be locked to accommodate other guests (who will use a separate entrance). Extras: Cleaning and linen fee (required, NZ$170.00 per stay). Lovely lakeview , hreat location, and Helen was easy to helpfulnto deal with. Highly recommend. The stay was very pleasant and a great spot. The stay was very pleasant and a great spot. Very warm and cosy. We stayed for a week and little things would have made the stay better. We only had one towel each and one tea towel for the week, a couple of towels would have been better. We could un-pack our bags because the closets were used as storage, no room to hang anything. Great views over the lake and close to the frankton track which was great. Great views over the lake and close to the frankton track which was great. A couple of niggly things to mention is that the cleaners before we checked in didn't clear the laundry from the washing machine. The kitchen lacked standard amenities like salt, pepper cooking oil. We were a group of 11 people and preffered to cook meals ourselves. Also bathrooms had no soap for showers. Kitchen also had no extra plastic rubbish bags for bins. Other than that we did enjoy our stay. Very comfortable place to stay, convenient location with lake view. We are after a view than a location. We are after a view than a location. The view is exactly what we want. It is only a few minutes drive to Queenstwon and Frankton main shopping centres, which doesn't bother us.